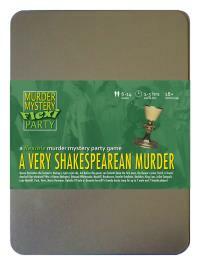 You've been invited to play the role of BENDOVERO in A Very Shakespearean Murder. What scream through yonder window breaks? Queen Derivative the Second is having a right royal ado, but before the guests can forketh down the first oxen, the Queen’s jester Yorick is found dead-ed! Join us to find out who-duneth-it! You pride yourself on always sporting the latest fashions. Your hat is the floppiest, your breeches are the puffiest, and your ruff is ridiculous. No frill, no feather and no colour is overlooked in your quest for style. From early childhood onwards you’ve always lived up to your name, a good natured soul who gets taken advantage of on a regular basis. For example, Edmund Whitesnake convinced you that he should inherit your title and estates for tax purposes, but since the transfer seems to think he’s the rightful Duke of Sark leaving you a bit short changed. Since meeting Romeo you’ve become besotted with him, since he’s the first good natured person you’ve come across in a long time. I am Bendovero, former Duke of Sark and best friend-eth to Romeo Magherd. Alas poor Yorick, he loved sea shells. And the sand too. Such, he would oft call his wife a beach. But privy this, I think I know-eth who stab-eth Yorick! Come hither and I shall pleasure you aurally with my tongue of truth.